Cream together the butter and sugar. Add the beaten eggs and bananas. Finally mix in the dry ingredients and walnuts then pour into a greased 9 by 5 by 3-inch loaf pan. Preheat the oven to 350 degrees and bake for 55 minutes or when a toothpick comes out clean. 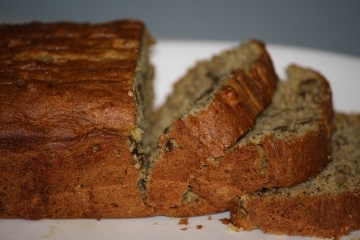 2 Responses to "Gluten Free Banana Walnut Bread"
Great idea with the flax, I’m glad it turned out good!